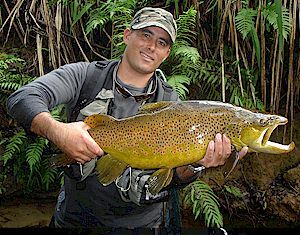 NZ's leading provider of double figure trophy browns! 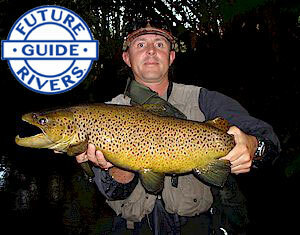 Miles Rushmer provides New Zealand's ultimate guided trophy trout fishing experience. Miles also keeps 13 dogs (#13 called "Lucky"!) and the wing shooting for pigeon, pheasant, quail, turkey and waterfowl, a mere 20 minutes drive from your accommodation, provides yet another wonderful add-value activity to your time spent in Miles's sporting domain. "These things look like dolphins in a small stream!" - Bayfisher magazine. then book right here right now!